This is a brand new Bolt On Spring Solo Seat Mounting Kit for the 2004-2006 Sportsters with copper powder coat coil springs! This kit was designed and manufactured by us right here in the USA. Now 2007-2009 Sportster owners can mount a spring solo seat to there bikes without hassles and modifications! This kit is is completely bolt on, and all the parts are included for a spring solo seat mounting, except the seat. Seats can be purchase in my listings and my store. The kit is easy to install. Some that have this kit installed have said that the seat is comfortable because of the extra cushion from the springs. The kit is sturdy professionally Powder coated 1/8" steel. The kit also included coil springs and necessary mounting hardware, a steel chrome plated hinge with a stainless steel bolt and stainless steel acorn nut. There are two rubbers on the bottom of the kit to protect your frame. Seats are sold separately. Any of my 10x13" and 12x13" range seats with 7" rear bolt spacing will work with this kit. 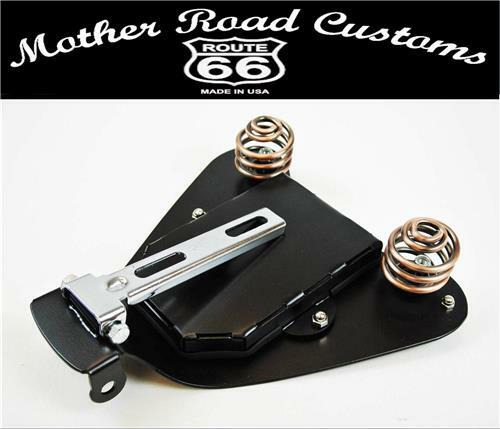 Thanks for shopping at Mother Road Customs!